Lindenwood's Kallie Bildner (upper left), photo courtesy LU Sports Info. Drury's Hailey Diestelkamp (upper right), photo courtesy DU Sports Info. 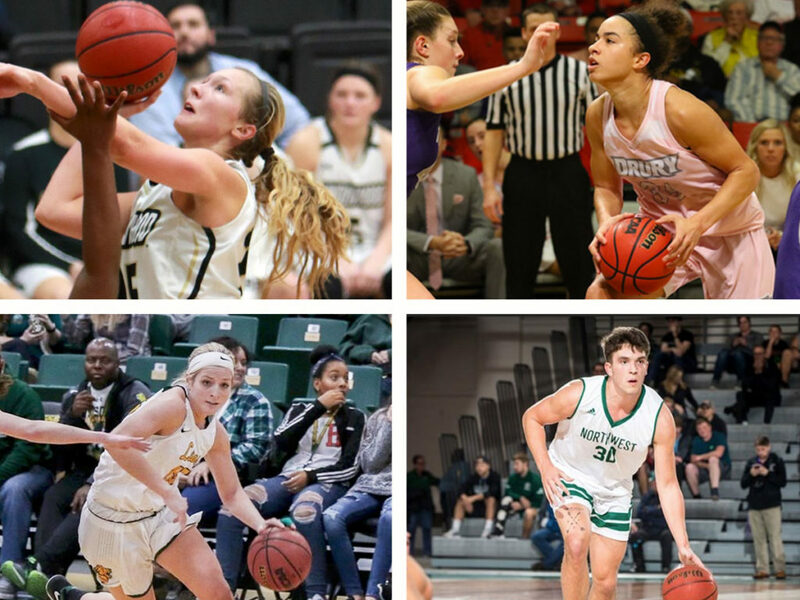 Missouri Southern's Chelsea Henry (lower left), photo courtesy MSSU Sports Info. Northwest Missouri's Joey Witthus (lower right), photo by Todd Weddle, courtesy Bearcat Sports Info. 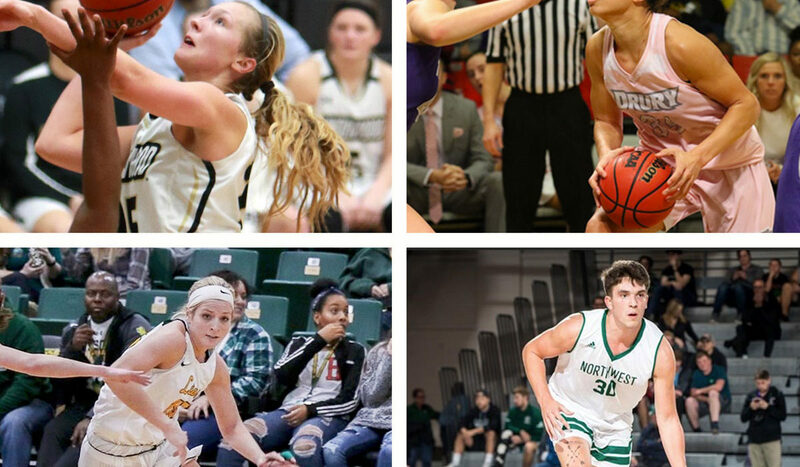 This week’s Missouri college Players of the Week are Kallie Bildner, LU; Hailey Diestelkamp, DU; Chelsea Henry, MSSU; and Joey Witthus, NWMSU. Bildner averaged 25.0 points and 15.5 rebounds as the Lions split on the road last week. The win came at Washburn and the junior scored 29 and brought in 19 boards – both were season highs. Her 17.3 pug and 10.4 rpg lead the MIAA. Diestelkamp helped the No. 1 team in D-II remain undefeated, averaging 22.5 points, 9 rebounds, and 1.5 steals last week. She had 23 points and 11 rebounds against Truman and has scored at least 22 in four straight games. Henry put up 24 points, including the game-winning three-pointer with five seconds left in a win over Northwest Missouri. The senior averaged 22.0 points and 5.0 rebounds for the weekend. Witthus had a career-high 36 points on 13-of-19 shooting (8-of-13 from behind the arc) in a win over Pitt State. Two nights later, he brought in 10 rebounds, tying a career-high, to go with 28 points as the No. 2 Bearcats defeated Missouri Southern.